Tiger Muay Thai and MMA Phuket welcomes UFC Veteran Dave Roberts. Fighting in the UFC prior to its acquisition by ZUFFA, Roberts returned as a contestant on the UFC Reality TV Show the Ultimate Fighter, losing in the Elimination round. A wrestler since a young age, Roberts has trained extensively in Southern California with many of the regions top fighters including; Rampage Jackson, Fabiano Iha, Razor Rob, Mayhem Miller, Tito Ortiz, Tiki, and Rico Rodriquez. 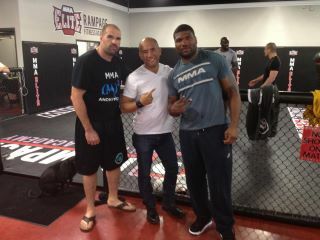 An original member of Team Oyama, Dave Roberts cornered Rampage Jackson during several of his historic PRIDE FC bouts. Look for Dave to hook the guest of Tiger Muay Thai up with a wrestling clinic during his stay.